Mr.Producer, what do you do? 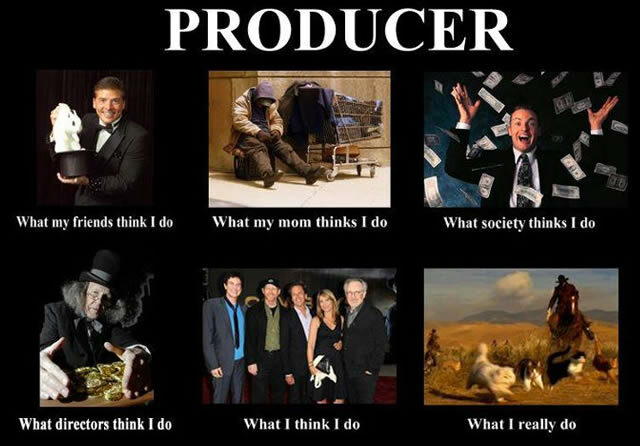 What does a Producer exactly do? "don't you just deal with the money" or "aren't you just the person who organises things"
Though the job can often be like herding cats, essential in my opinion its a role that involves you be the project owner from start to finish and often beyond. The Producer is quite often the person who comes up with the initial idea or are commissioned to make it, being responsible for the content creation and its eventual delivery long after everyone else involved has finished their job. While on 'What just happened' its well worth reading the book by Art Linson, its a great read on the trials & tribulations of being a producer and you'll discover that the scene above is based on the real event of Alec Baldwin in 'The Edge'. Commercial producing certainly has similarities to the movie producer, but on a smaller scale. In my own experience producing content for brands like Google, Nokia and McDonalds, a producer's role is to deliver a project whilst preserving the integrity, voice and vision of that brand. Building the best and most appropriate team to deliver a project on time and on budget. Because of the nature of the content, a producer would quite often come on only when the client (or agency) have something they want to make and finish once its delivered. Where the traditional film producer will be involved earlier and quite often continue to be involved after delivery working on distribution and marketing of the film. Gaming also has its own producers, not something I'm personally that experienced with. Though I know that there are a certain people coining the term SuperProducer for cross platform content creation particularly in relation to gaming and the producer being responsible for the creation of all the content types. This role has really yet to seep into the mainstream and in my opinion still some time off being widely regarded to be essential. Producer derivatives are one thing, however I'm personally against terms that pigeon hole the role. The term creative producer is a good example of this, and when people call themselves a creative producer I'm immediately quite wary. Reason being if you're just going to be a creative what about all the other work that a producer does? The whole thing about being a producer for me is (for lack of a better phrase) having a finger in every pie. Being able to manage people, budgets, schedules, development, marketing and yes among other skills - creative. A producer may not be an expert in all these fields, they should however be able to get stuck in and be competent in all the required areas. The role of the producer is to a degree changing in the most recent years, particularly with independent film making. Roles such as Producer of Marketing and Distribution (PMD for short) are becoming more common. They tend to come on board once the film has been shot or at least fully funded and you want to start developing marketing and distribution strategies for the film. With how we consume films changing, producers need to find new ways to access audiences and fans by tapping into social media and creating work across platforms types. I've found out myself, Crowd-Funding plays a key role in reaching out to and engaging with audiences, whilst securing funding. As with my own experience on the Kickstarter campaign for The Fitzroy, a producer needs to be able to manage a campaign. From developing the rewards, creating content such as videos, pictures and copy through to responding to audience questions as and when they come. Its daunting task, but if done successfully a hugely rewarding one personally and commercially. Personally I love producing due to the variety of work involved and people I get to work with, gaining the oppotunity to experience and learn from all areas of the media industry. I can't think of anything that can be more enriching than that. I should add all of the above is strictly my opinion on what I believe the role of a producer to involve, others may well I have a different take on it and thats completely fine. I hope my thoughts have helped solve any of the mystery around producing you may have had. Though if I've still left you in limbo and you do have many more questions or would like to know a little more detail, please do get in touch with me directly.